Editor’s note: Tadhg Kelly is a games industry consultant, freelance designer and creator of leading design blog What Games Are. You can follow him on Twitter here. And yet as more of the movement’s research and uncovering activities continue, they focus on women. Fresh targets like Kris Ligman and Adrienne Shaw replace Zoe Quinn. In discussing it on Facebook with several industry friends who’ve taken a stance, there is a clear distinction between how the women are being treated versus the men. Some women repost mind-boggling tweets, links, images and so on for us all to stare at agog. Us men? We just get told we’re wrong a lot, and probably corrupt. The second most consistent answer is that gamergate is about journalistic integrity. This graphic explains that it’s about collusion, about games not being judged fairly on their mechanical and structural merits, and about being suppressed because they don’t match reviewer politics. It’s a call for a journalistic style. It’s to say that games reviews (and by extension, games) shouldn’t be about content or tone. They should be about whether the shotgun physics feel right and how many modes there are. Games should be reviewed like cars or smartphones, all about what they do rather than what they are. The key terms here are mechanics and structure. 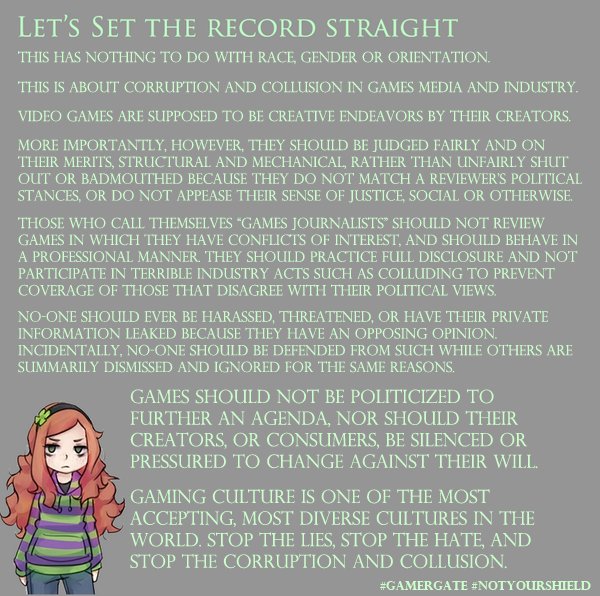 They’re an advocacy, what gamergaters want. That is to say they want games to go back to being products rather than aspiring to be artworks. That they want games to only be those things. That is gamergate’s answer. The tension between games-as-culture and games-as-product has existed forever, between sexiness and worthiness. For example all through the years of social and mobile, casual and many other kinds of game there’s been a simmering resentment from those who considered themselves “real gamers”. They look at such games and think they’re a product of press hype, not merited and therefore not deserving of success. This is why the press is gamergate’s most direct target, but really it’s about why “worthy” games don’t get their “just reward”. Why this is so is hard to answer. I could theorize that it has something to do with roots in outsider culture maybe (certainly more than once I’ve heard the phrase “cool kids table” in this whole argument). It may have something to do with a kind of inverse snobbery about the games scene versus other media. Whatever the source it’s long been a thing, particularly as some (and it’s only some) journalists started to follow the music-industry style New Games Journalism. To some that always felt imposed. Regardless, it’s there. But many TechCrunch readers might be wondering so what? What does any of this war among the gamers have to do with how games monetize in Asia? What does it have to do with how well Destiny has sold and Activision’s future in mega-AAA gaming? What tangential relationship does it have with the Apple Watch and what gaming applications it might enable? What does it have to do with the structure of mobile gaming and its one-hit-wonder problem? Does gamergate relate to that big screen iPhone? And the answer is both nothing and everything. In terms of platforms and money, who invests in who and who’s making how many ludicrous millions per day from a mobile game, gamergate is a burp from a corner of the Internet that’s slowly being disrupted and not liking it. But it’s also about how games are changing, or at least trying to change. It’s about what products you might be making in the future. In many venues games are trying to deepen along all lines, not just mechanics or economics, and it’s important. On many newer platforms we’ve seen a rush to novelty and pure fun of course, but as those platforms grow more established content starts to become more important. Tone, issues, character representation and so on all factor into audience building. They matter independent of gameplay. Games become cultural phenomena, not just business models. But what happens if the culture is not there? What happens if the enthusiast community becomes so culturally polarized that it essentially becomes anti-content-innovation? What happens if it demands that games only be escapist fantasies? As I see it that’s what the fight over gamergate is really about. Whether games are more, or less. Gamergate may want mechanical purity free of the sullying of media, but personally I feel that that is the wrong answer. Any answer that starts or ends with demands for games only to be looked at as products is a demand for a smaller rather than a larger universe. It’s a demand to be pleased at the expense of everyone else who might like to play a game but not engaged with the Gamer nation. It’s a demand that flies in the face of where all the rest of our culture is going and will continue to go. Their answer is reversion, but it can’t work. For game makers the question is whether to buy into that Little Gaming view, or whether to reject it. If gamers are determined to become a smaller and ideological tribe than they already are, at some point the economics of buying them simply won’t make sense. Indeed they may already not. The medium already started to move and its media began to notice. Asking it to change back is no answer at all.